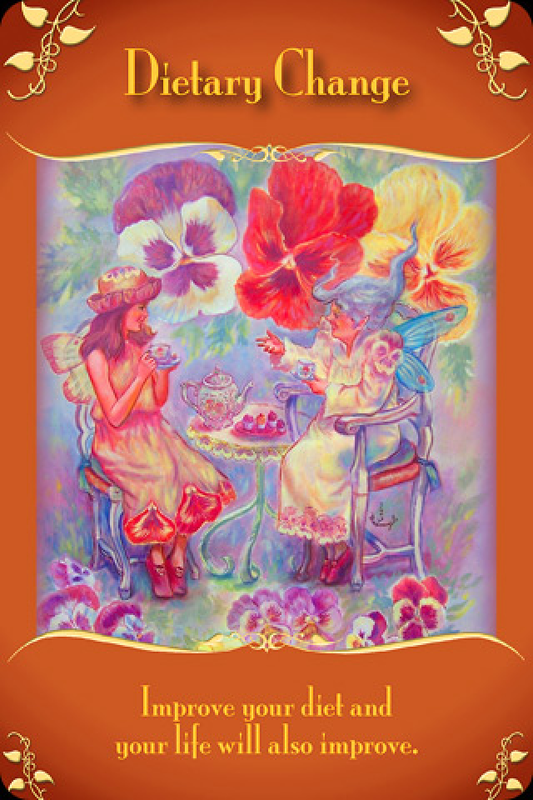 Card: Dietary Change – from the Magical Messages from the Fairies Oracle Cards by Doreen Virtue. Message from The Faeries: Erin says that it’s a bit annoying and cliche that we chose this card for you this week. We appreciate her sentiment, but the truthfully this card is intentional for all of you this week. As you are probably well aware, January 1st is coming up this week. This day is the beginning of the New Year in many cultures around the world. Many of you observe this day in some form or another, so it has energetically become a very significant day. As you find yourself entering the year 2015, we would like for you to really put some thought into what kind of life you would like to have for yourself this year. What kind of life would you like to create for yourself? When you look back at 2015, how do you want your story to have read? It would be prudent of you to really spend the first part of the week to set some important goals for yourself for 2015. You can even begin to take the next step and start putting your dreams into action. It’s very important that you start 2015 off knowing that is a fresh start. Leave 2014 behind you. If you want, you can spend a few days before the new year going over the past year and remembering all the hard lessons you learned, but you will begin 2015 with a clean slate. What better way to start a new chapter in your life then with a clear body and a clear mind. One of the best ways to accomplish this is through meditation, diet and exercise. We realize that you all have different bodies that work very uniquely from one another, and we would never make a broad sweeping dietary statement for that could apply to everyone. We highly recommend that you go see a nutritionist, naturopath or healer that you trust to put you on the right track on what is best for you. You may want to investigate further by going to see an ayurvedic doctor or a chinese medicine doctor. Your body is a complex entity that is special to you. Ultimately you know what is best for your body. What messages has your body been trying to send you? Has it been asking you to eat less meat? Has been begging you to eat more fresh fruit and vegetables? We hate to break it you, but you really are what you eat. Really think about that. What have you been putting into your body? If you eat lots of fresh fruits and vegetables, think about all the bright colours and tastes. Plants are medicine. All of them. So when you eat lots of plant foods, you will naturally feel much better.These foods will help clear your mind. Of course, your body needs fats and proteins as well. One thing that we can promise you is that your body absolutely does not need refined sugars. It’s okay to have on very rare occasions as a very special treat, but we would say that would be once or twice a year. If you can completely cut it out of your life, even better. Start the year off on the right foot by eating the most healthy and nutritious food you can think of and by getting lots of exercise. Start your days off by meditating for at least 5 minutes. We know that you all want to have an amazing 2015, so why not start it off on the best note possible. Celebrate the coming of the new year with healthy choices, and this will set the tone for your year to come. We wish you all the best for the year 2015. All of Erin’s tarot readings are 50% off until the end of January. You can get a full 1 year reading for 2015 for just $30 right now. An amazing deal that you can find here on Etsy. This entry was posted in Faerie Reading and tagged change, diet, Faeries, fairy, Healing, new year by faeriemessenger. Bookmark the permalink.